When making a 2D game one usually must assemble several images (sprites) into a single big texture (sprite sheet). On the game the sprite sheet will be loaded and the different sprites will be shown accordingly to game events or the game internal time (animations). In the game you will load a unique image that conforms all the steps of the previous animation. Manually assembling that image is a really boring and (thus) error-prone task, but luckily we can avoid it using a shell script and ImageMagick. We are specially interested in the compose capabilities which will allow us seamlessly assembling these sprite sheets. This operation is performed with the montage command line. Joining this powerful tool with the a shell script interpreter like bash is something that will save you hours of repetitive work. -tile reflects the organization of steps. 4×2 means that it has 4 columns and 2 rows, 8×1 would mean 8 columns and 1 row, etc. -geometry gives the size and position of each step. 128×128 means that the images are 128 pixels wide and 128 pixels tall. +0+0 means that the origin of the image is in the top-left of the image. -background provides the color (or lack of it) for the background of the final image. In our case we use the keyword transparent to make use of the transparency of the animation. 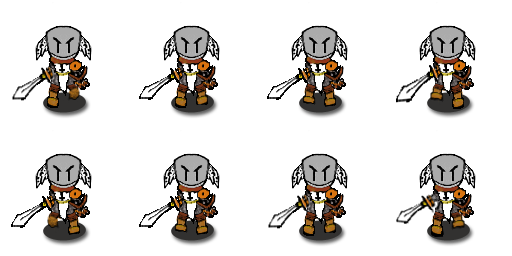 As a final note, notice that a similar montage command can be used to assemble different animation sprite sheet, like the one presented in the above figure, into a single super sprite sheet like the ones found on the Internet. I guess it’s been a while, but thanks a bunch for this helpful blogpost. Helped me out a lot.